Etsyians over for dinner and a craft night. Beth from love, september would be in attendance. She is a former teacher and reading specialist, until three years ago when she became a mom and crafter extradorinare. She makes brilliant things that she actually uses on a daily basis with her own kids. 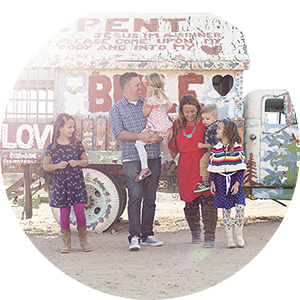 They all pass the test of her rambunctious toddler, Jakson and sweet infant, Storey. of finding the crate and the pesky sewing! Beth is a girl after my own heart. She creates during naptime, stays up really late and eats her feelings. 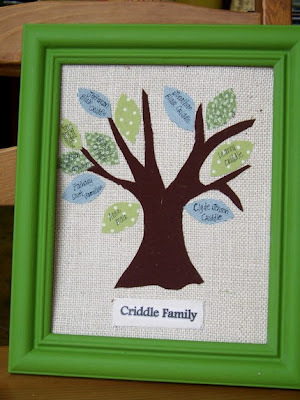 How cute is this DIY family tree kit? Love it! Brilliant Mother's Day gift I'd say. You will be seeing Janey in this onesie. I promise. My life is full of Blog This moments. Beth is a blogging machine! She has her family blog, Vermillion Rules, which I heart. Her family's antics and her writing style is pure happiness. She also is a Lesson Plan Editor at Craft Gossip. Which is brilliant and you need to subscribe to. features fab Etsy shops and handmade giveaways. Meet Storey. Could you not eat her up??? making tutus to benefit Cora's Playground. You know me, I love a generous girl! As I pack up Janey's 0-3 month clothes and my heart breaks into a million pieces thinking I may never have another girl, I am a little encouraged that someday the sweet little oufits could become pieces of a custom quilt. You know how I am always on the lookout for non-girlie handmade gifts. Who could go wrong with a superhero cape? No boy (or girl) should be without one. Look at this brilliant personalized Eye Spy quilt! A cozy mat for a baby to play on, which will last well past their toddler years. It even has a tag on the back listing all of the hidden objects. Imagine a young reader's joy to sound out a word on the list and then actually find what they are looking for on the front. It even has two of each square to play matching games. A girlie version is in the works as well. One winner will get their very own Eye Spy Quilt! Come back here and leave it in the comment section. For extra entries, blog (include the link), twitter, or facebook about it. Leave a new comment for each different chance. I love the Cozy Crawlers. Comments will be open through the weekend and a winner will be chosen on Monday. P.S. Happy Wolverine day for my fellow nerds! I love Bethany and her shop! :) Everything she makes is adorable! I have my eye on a baby sling....just waiting to find out if I'm having a boy or girl first! Wow! What a cute shop!! I would love a crate cover. Did you know she gives you the crate too?!?! SO Awesome! Her stuff is so cute! My nephew would love one of those adorable capes for his b-day. The superhero masks and capes are awesome! Thanks for the hook-up! i can't help but love the quilt made from my child's clothes. my baby is now 2 and i still can't seem to part with any of his things. he may just be my last one, and that makes it even harder!! My favorite is definitely the clothes memory quilt. What a wonderful idea. We've passed along most of our baby clothes, but I've kept a Rubbermaid container or two of things I just couldn't part with. This is a perfect solution for keeping the memories in usable form. Thanks for the post and giveaway! My 'doesn't-stop-for-a-moment' 2yr old son would L-O-V-E a superhero cape. I am envisioning the pictures already! LOVE love LOVE the tutus. They are so adorable! Hope I win! Thanks for this cute give away. I think the vw shirt is too cute. 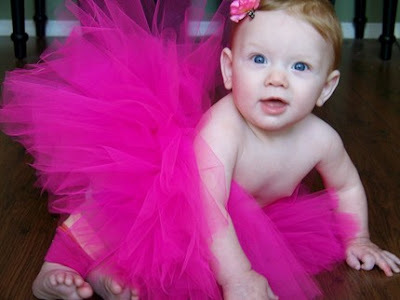 I love the infant tutu's. ADORABLE!!! I really love the Navy Patchwork and Flannel Quilt! Everything is so cool. i love the Elizabeth Pouch. Wow how fun, I really love the tutu's especially the fushia one. Thanks for sharing. I like the Emma reversible pouch sling. So cute! I fully agree: Beth is awesome!! I have never met her in person but I feel like I know her through her blogs. Every day I check her blog to find out what she and her family are up to. I love the Cozy Crawlers with Pink Dots. If I win, I would give those to my friend who has a little girl in need of leg warmers. bibs4dripsentered this giveaway of Beth's stuff: http://tinyurl.com/cqcq8j. you should check it out. Love it! I actually just bought the Blog This onesie and the superhero mask. So Cute!! And I have my eye on a few of the repurposed items too (like the dress made from dad's shirt. Tooooooo cute.). All of her things are great but I love love love the Little Birdie Iron on Applique. I love the Ladies Fabulous Fall Navy and Flowers Skirt. Adorable!!!! I love the I spy quilts and the blog this shirts! So cute! I'm loving (along with my three kids) the Superkid Capes!!! Really cool shop! I love the fushia tutu that Storey is wearing! I have had my eye on it since the Cora Fund. Such a cute shop! 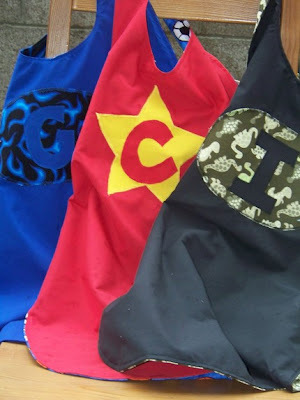 i love the super hero capes, my three little ones would have a blast running around in some! Wow, thanks SO much for sharing her shop! I'm so excited to find an affordable cape for my little guy! I think my favorite thing is the quilt made with all the old clothes, it is beautiful!! I love the tutu's and the family tree! Thanks for sharing! Love the family tree kit! What a cute idea! I really love the Fabric Family Tree Wall Art! Great Shop! I love the clothes quilt! 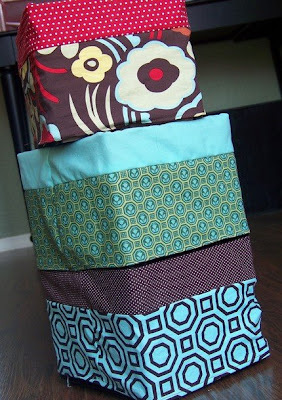 I love the fabric covered crates/boxes. Would love some of these yummy fabrics for my daughters room! And facebooked (is that a word?) it! I'm loving the Twin Size Heirloom Memory Quilt. Love the idea of the capes, so cute. Gosh, loved a WHOLE lot of things in her shop. I WANT, NEED, Must have that "Eye Spy" Quilt...absolutely wonderful!!! The Elizabeth Reversible Pouch Sling is my favorite from her site, and trust me I will be ordering it when I need one again. But I would love to win the I Spy Quilt for now! Ohmygosh! I LOVE the Razzle Red Ruffle Full Apron. Oh ... soooooo pretty. Love, love, love it! And her store! Thanks for the link ... I'm favorited her. What an adorable shop, and I too can relate to her with crafting during naptime (when I'm not online, that is) and staying up late and eating my feelings! My favorite item is the Small Fabric Covered Crate. What a great idea for dressing up a nursery on the inexpensive side. I like the little Bird iron on. Found you from Katydid! I am in love with the superhero capes! My nephew is arriving in a month and would love for him to have one of those! awwwww! tweeted about it here...i am unsure how to post the direct link to the tweet, but that's my page link! sorry! I love her shop. Thank you for blogging about it! Any and all of her slings are beautiful. Love them. The photo quilt is so cute! I am new to your blog and I LOVE your blog! I have twin daughters and I love to sew, paint & make hairbows & headbands. I read Joy's story and what a loving & touching story! You have gained a new follower - Me! Thanks for having such a wonderful blog with wonderful posts & great tutorials!!!!! 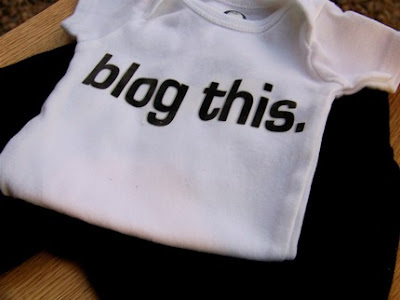 I love the BLOG THIS onesie! I love to see such creativity! Those crates are fun! I love the Harriet Reversible Pouch. Very cute fabric. I like the slings. I use mine every day. They are amazing! They are small enough to stuff in your diaper bag so that you are never without a way to hold the baby. This is useful when you have an infant in the sling, a one year old holding one hand, and a two year old holding on to the right. I couldn't go shopping without the sling! Hey! I blogged about Bethany and her cutie shop. wow, I don't know what happened to my original comment. I LOVE, LOVE, LOVE the VW bus onesie and the fluffy, breezy tu-tu. Hard to make a decision, though. Her products are cute!!! LOVE the VW onesie... I've been watching it on Etsy hoping for a relative to buy it for baby #5!!! I like the Custom Baby Clothes Memory Quilt! I love the Adult Custom Tutu. I like the Little Birdie Appliqued Baby Onesie-Short Sleeve! this is the one that caught my eye! So many nice things from this talented woman. I have a thing for aprons, though, and my favorite item in her shop is the Razzle Red Ruffle Full Apron. Have some great items. i would love to have the Heather Bailey Sway and Red Minky Stroller Sized Blanket or Quilt. My favorite is the The Jane Reversible Pouch Sling for baby to toddler-ANY SIZE. Thanks for the opportunity! I love the Lucy Reversible Pouch Sling for newborn to toddler. This is perfect for the basket I'm making up for a surprise baby shower! Thank you for the contest! I love the Unique Heather Bailey Sway and Red Minky Stroller Sized Blanket. What a talented lady!!! She did a remarkable job on her shop. I love her work. My favourite is Personalized Fabric Family Tree Wall Art! Great shop! I like the Personalized Fabric Family Tree Wall Art. I'm a hippie at heart, so I love the VW Bus Applique Toddler Shirt-Short Sleeve. The pouch slings are great as well. I love the VW Bus Applique Toddler Shirt-Short Sleeve and the giveaway blanket! I love the Memory Photo Quilt! Would love to have one made someday. My son has one of Bethany's capes and he (and my daughter) loves it! They fight over it! Thanks for the chance to win such a sweet giveaway! The Emma Reversible Pouch Sling is my favorite! Ilove the Navy Patchwork and flannel quilt. What a great shop! I adore the Unique Heather Bailey Sway and Red Minky Stroller Sized Blanket or Quilt! Gorgeous! Thanks! I love the Navy Patchwork and Flannel Quilt-Unisex. I love the sweet Grace flowered dress for a newborn! I can not get enough of the super hero capes. I like the "VW Bus Applique Toddler Shirt-Short Sleeve" best. Cute. i love the clothes memory quilt. The one-of-a-kind items are fantastic, for production items - I'll go with the VW shirt. My favorite is the Harriet Reversible Pouch! I like her Custom Twin Size Heirloom Photo memory Quilt. It would make the BEST gift for someone special. What an awesome giveaway! I LOVE this blanket! I'm also loving the Unique Heather Bailey Sway and Red Minky Stroller Sized Blanket or Quilt. Great shop!! What an adorable shop! I love the Elizabeth Reversible Pouch! Very cute chop! I like the Ladies Fabulous Fall Navy and Flowers Skirt! Thanks for the chance! I love the VW bus applique! I love the Elizabeth sling! I love that shop and I LOVE LOVE LOVE the clothes memory quilt! Gotta be the Superkid Capes! Wow - I just found your blog through the daily digi and added your link AT ONCE! to my own blog. Love it! Love the Heirloom Memory Photo Quilt! I love the crate covers! They come in awesome colors. cute cute cute shop!! and great giveaway! I love the Navy Patchwork and Flannel Quilt. I really like the Harriet Reversible Pouch. I just adoreRazzle Red Ruffle Full Apron. What an amazing site. And how great are the blog this onsie and sling gift certificate (so the mommy can pick her own favorite fabric!) as baby shower gifts!! 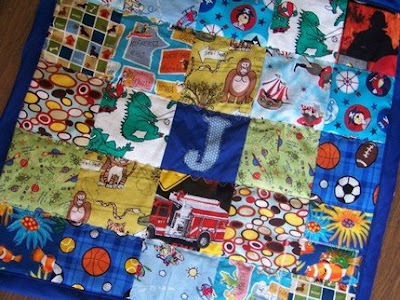 I love the great Eye Spy quilt and also like her Personalized Reversible Superkid Cape. Love the Heirloom Memory Photo Quilt. She makes great stuff! Would love to win this for my kiddos! I love the reversible pouch sling...so cute! There are a lot of cute things to choose from in the love, september shop. If I had some extra money to spend, I'd be buying superkid masks, capes, a blog this onesie, a fabric family tree, & 3 eye spy quilts! Cute, cute! I love the fabric covered crate. . . what a clever idea! SLING SALE Georgiana Reversible Pouch Sling for newborn to toddler-ANY SIZE is my fav! I like the Elizabeth reversible pouch sling. Love the superhero capes, and the Storey dress..super cute! I love the Small Fabric Covered Crate! I love the Two Small Fabric Covered Crate-Perfect Easter Baskets-includes the crate!! 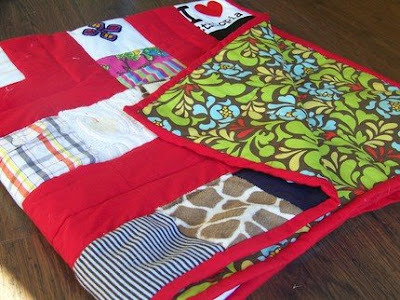 LOVE LOVE LOVE the Custom Baby Clothes Memory Quilt! I had something similar made from all my MIL's t-shirts/sweatshirts for my husband & his sisters a few years ago...they treasure them! Such cute stuff! I think my favs are a tie between the family tree and the eye spy quilt (but the super hero masks are pretty fun too!) Thanks for the giveaway!! I like the Blog This--onesie. I think my favorite are the quilts. I love quilts. Can't ever get enough! I love the Custom Twin-Size Heirloom Memory Photo Quilt! Also tweeted about it @quietasariot ;). Yaaay Wolverine! I love the heather Bailey minkee stroller blanket. I love minkee. Great giveaway! I checked,and her store was already in my favs! I think my fav is the blog this shirt!!!! I just twittered about the contest! ok, truth be told, I am not a blogger, but I did post a note about the giveaway in my etsy store announcement, and I get tons of traffic! I just found this shop the other day!! LOVE IT!! Oh and I love the memory photo quilt--so special! I love the crate covers!